The Stuyvesant Fish House became a bustling scene of intergenerational Cooper Union pride on November 6th as students mingled with major donors at the first annual Cooper Fund Leadership Circle Reception. The crowd included Deans, faculty, staff and the host, President Bharucha, all of whom were there to celebrate the generosity of those who had donated $10,000 or more to Cooper in the past year. "The Cooper Fund Leadership Circle program promotes major gifts to The Cooper Union," Jeanne Lunin, Director of Development, says. "If you make a donation of $10,000 or more, either as an unrestricted gift to the Annual Fund or as a restricted gift for a specific purpose, you are invited to become a member of the Leadership Circle." Leadership Circle donors have the opportunity to name annual tuition scholarships, student grants and fellowships, and academic enhancements, among other programs. "This allows donors to be recognized for their support while directly connecting them with students," Jennifer Durst, Major Gifts Officer says. 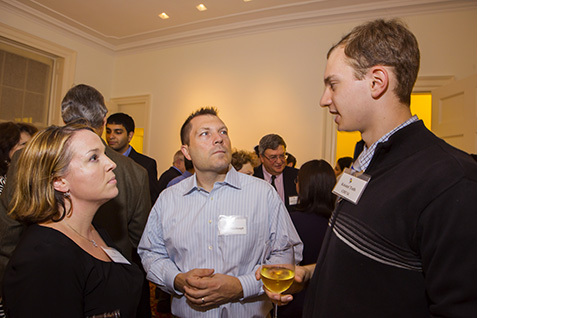 The annual reception will be a way that many students can meet donors who support their education. "It was a really fun event to go to," Jennifer Fenton Weishaupt (ChE'95), a donor who sponsored two scholarships this year, says. "It makes a more personal connection to the school and student body. It connects donors with the beneficiaries of their gift: college students getting their education." Ms. Weishaupt had the opportunity to meet one of the students whose scholarship bears her name, Kristof Toth, a chemical engineering senior. 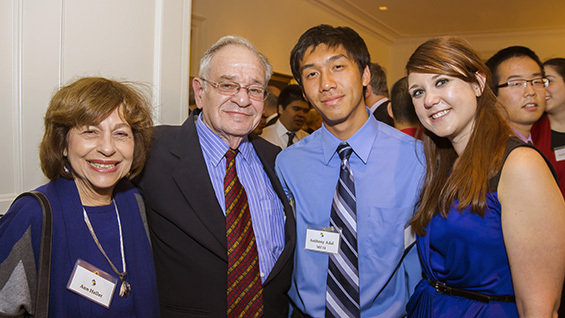 Alumni donors are matched with students pursuing the same degree. "It was good to talk to him about his future plans. I was able to give him some feedback on what I did and what I might have done differently in hindsight," she says. Naturally, being a Cooper Union student, Kristof had done his homework prior to the reception. "I read an alumni article [At Cooper Winter 2008/9] about her and what she has been up to," he says of Ms. Weishaupt, who is a Project Manager for Shell in New Orleans. "I asked her some questions about what to do after Cooper and we talked about professors that we both had. The atmosphere was very welcoming. There were no doubts about whether we could talk to the donors. It created a connection to philanthropy. Not just donating to a bottom line, but to a person. I got a greater appreciation for how the administration is trying to raise funds. It was a manifestation of what Cooper is and paying forward on that." "It was incredible," Jeanne Lunin says. "Two or three and sometimes four students crowded around donors who were clearly thrilled. The atmosphere was warm and there were a lot of smiling faces and animated conversations." President Bharucha spoke briefly and then turned over the microphone to three students, one from each school, who said a few words. Jemuel Joseph, a fifth year architecture student, spoke of his background as an immigrant from Ethiopia and how, even as a high school student in New Jersey, he lacked a framework to develop his interest in design until Cooper made it possible in spite of the financial hurdles the world presents. "The reception helped me reflect on the people who gave in the past," Ms. Weishaupt says. "I know that throughout my years as a student, I was always aware of the fact that decisions made by people before me were what made the school possible. I try to make a point to donate every year and make my gift continue to reflect what I can afford at the time."